This is a simplification of the poses that we did in the workshop that is meant to be a guide for home practice. Start with a resting pose, especially if you are experiencing any pain. Shoulder Savasana with weights on the shoulders and arms. Sandbags are used here but you can get creative! Then move on to "re-patterning" the shape of your shoulders and upper girdle of the torso. You will feel strong sensations in the wrist, arm and shoulder here but should not feel shooting nerve pain. Back it up if this happens. Watch a video of Lois teaching this pose! Next, open the front of your chest and particularly the armpit area. Watch a video of Lois teaching this here. Next for some chair twists, Bharadvajasana. If you also have lower back issues, make sure that you are executing these twists from the diaphragmatic area vs. the lumbar spine and sacrum. Watch Lois teach this pose! Another standing twist, Utthita Marichyasana. In this one use the legs and arms to find length in the torso vs. screwing yourself down into a twist. Ascend and twist from the bottom back ribs. 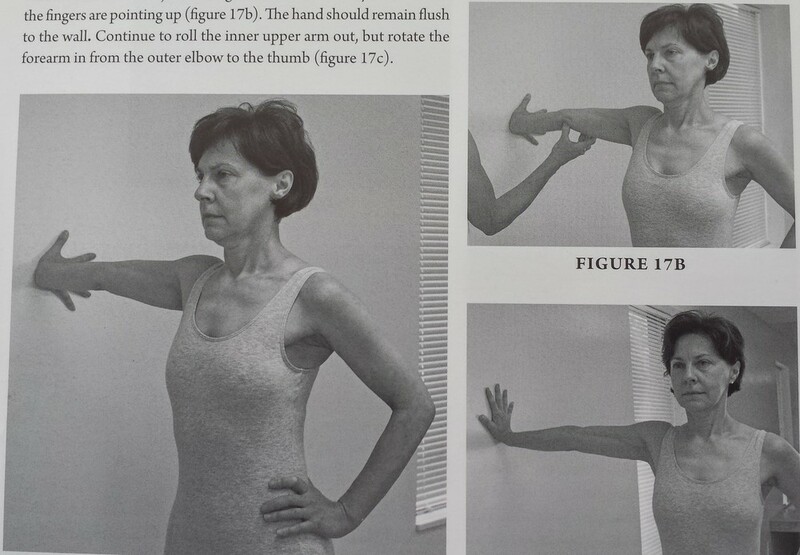 Use the actions from the arm exercises at the wall earlier to inform your twists. Finally, rest again in a supported version of Viparita Karani (Inverted Action or Lake pose). 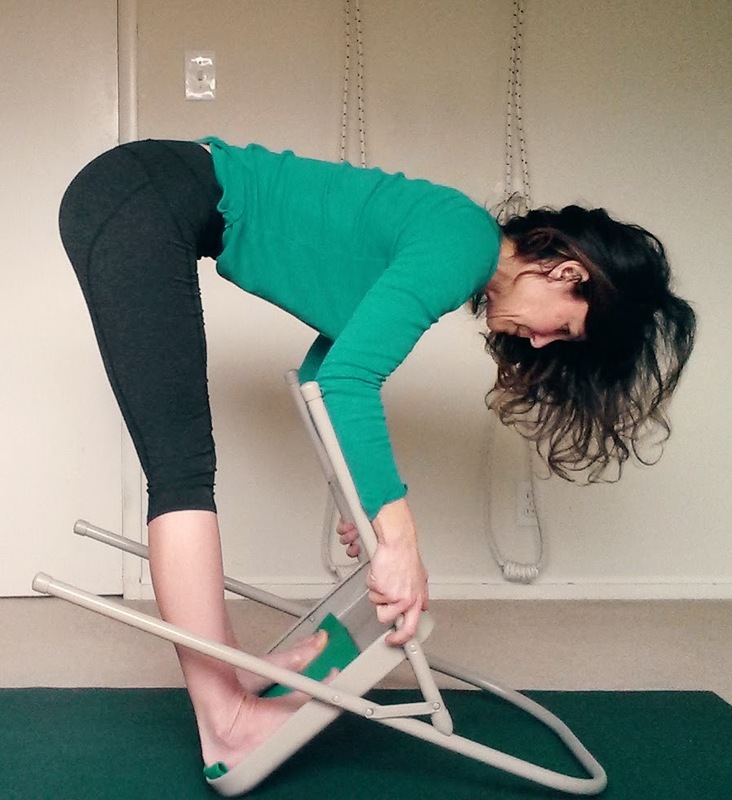 A chair can be used in leue of the Halasana box that is used in the photo. Be sure that your lower back and pelvis feels secure and rested on the bolster so the abdomen is placid and spreading. Open your chest by releasing the shoulders to the floor and spreading the bottom, front floating ribs (the diaphragm). Breath should be through the nose and soft, even, smooth and tranquil. At the end of the practice, take some version of Savasana, either face up or face down. Observe the transformation from the practice you did. Allow the effects of the practice to percolate and fill all the cells of your body. Urdhva Dhanurasana (Upward Facing Bow - this is NOT "wheel pose") is a quite difficult back extension pose but extremely invigorating, creating joy and energy in the body and mind. However, he of course was right! If you imagine yourself as a bow being drawn and lengthen your spine like a rainbow then you will not experience any pain. Below is a series using a bolster support, a wall and blocks which will help most people to get up into the pose. A supported version on a "yoga" ball that is great for lower and upper back tension and breaking up depression. And, naturally the master demonstrates a supported version that he could easily stay in for 20-30 minutes. This series of standing, supported forward bends are a great start to a practice focused on either high or low blood pressure. In fact, they are a great way to decompress and de-stress before starting any yoga practice session. Be sure to use height and supports so you can sustain the poses for 3-5-10 minutes comfortably. As B.K.S. Iyengar says in the Yoga Sutras of Patanjali, the asana (posture) should feel nourishing and illuminative otherwise they're not yoga asana. 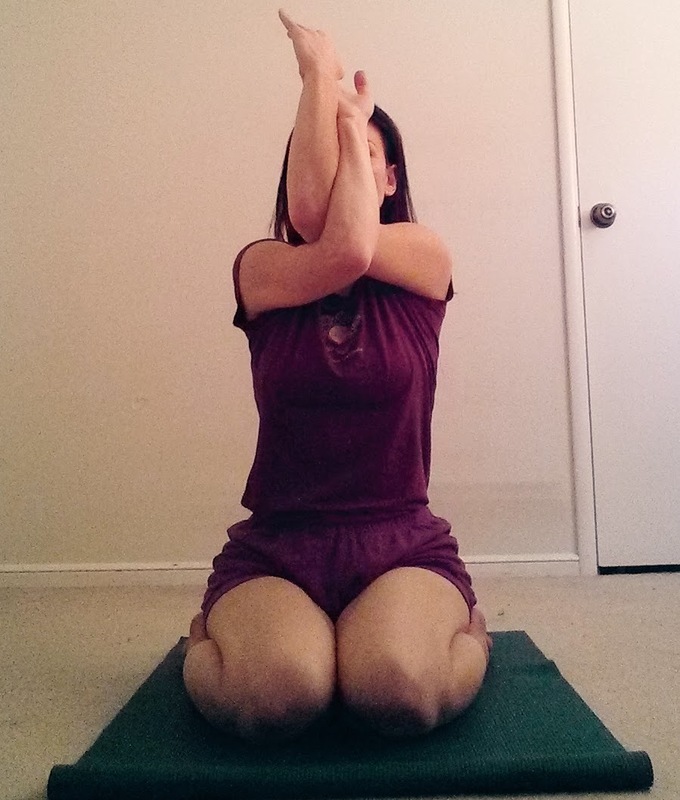 Note: The first version the head is handing and shoulders are supported; the second version the head is resting and the shoulder are releasing. Note: Second version is Lois Steinberg demonstrating a version that can be used for pregnancy. If you are not pregnant, you can join the bolsters and rest the whole torso forward. Dwi Pada Viparita Dandasana is a backbended pose that B.K.S. Iyengar calls the "yogi's prayer", "The Hindu devotee prostrates himself before the Lord by lying flat upon the floor, face downwards, with arms outstretched. The Yogi on the other hand prostrates himself in the graceful inverted arch, Dwi Pada Viparita Dandasana." What is the one of the major contributors to health problems these days? Stress. And, most of that stress comes from our own projected worries about life. In other words, it is our own mind that is creating problems. Luckily for us, we're yogis! And, we know that the mind and the body are not separate. Therefore, we can transform the mind through the body and vice versa. Balancing poses are a great way to take yourself out of your head an into your body. 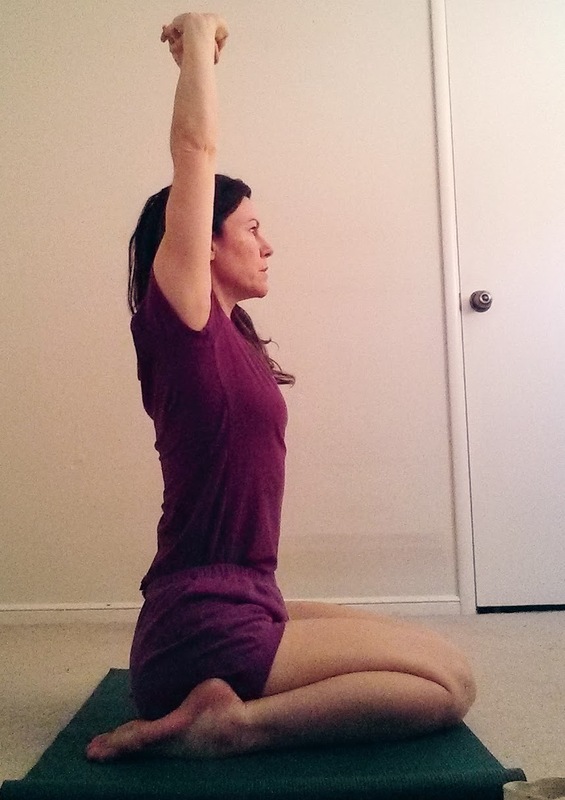 This continuous vinyasa of balancing standing poses (inspired by Carrie Owerko!) allows you to fly in your spirit. Don't believe me? Try it for yourself! Remember, the goal is not to be perfect but to stay firm, steady and uplifted. Yoga for Your Heart: Rock & Roll! Is your heart feeling heavy, depressed, anxious? Then, sometimes you just gotta' "Shake it Off"! Yogi Zain and I are doing a rolling practice to get things moving. We start from Paschimottanasana (intense stretch of the west) which is a forward bend to Halasana (plow) which is an inverted forward bend. Then, we mix it up with Malasana (garland pose) a standing squat, to Uttanasana (intense stretch) standing forward bend, to Urdhva Ekapadattanasana (One leg extended up) another standing forward bend, to Adho Mukha Svanasana (Downward Facing Dog). Do you think they called it "partner yoga" when B.K.S. Iyengar adjusted students as above in the 1950s? I doubt it! He said that before he "invented" props, he had to use his body to adjust students because he didn't have anything else. As a very serious Certified Iyengar Yoga Teacher (CIYT) I sometimes have a little trouble loosening up. There I said it! Thank goodness for friends like Yogi Zain. As we were playing around shooting videos and photos for this month's Daily Yoga Forecast, he suggested this partner drop back. I said "sure!" and fearlessly dropped back into the unknown. What shocked me more was that I didn't tighten up or even consider fear while I was doing the pose with Zain. It wasn't until afterwards that I said, "Hey, that's a good practice in trust." Surely, this would be a fun one to play with your kids too! I bet my cat would be pretty good at the drop back but I don't think he would support me. Yoga for Your Heart: Happy New Year of the Fire Monkey! Go back, way back for some of us, to the day of childhood where you felt completely uninhibited. You didn't worry about how you looked or whether you did something perfectly or not. You just tried stuff out simply to experience the feeling and have fun. Chakrasana (Wheel pose) is a moving sequence (krama) going from Adho Mukha Vrksasana (Full Arm Balance) to Urdhva Dhanurasana (Upward Facing Bow) back and forth. Yogi Zain and I are using a wall for support while we have a lot of fun together! Maybe this is just your day to try and kick up into a full arm balance? Don't worry whether you actually get up or not. It's the process and the movement that count. Uttanasana is a standing forward bend. In this version, the upper shoulders are supported on the backs of two chairs so the head hangs. Effort remains in the legs which I have elevated on two blocks due to my height. Optimally, you want your inner shoulder at the base of the neck (not the collar bones) to rest on the chairs. The benefits of this pose will be realized if you are able to stay with ease for 5-10 minutes. Purvottanasana (Intense stretch of the the East/Front side of the body) is a back bending posture. One that we probably couldn't stay in for much longer than 30 seconds so let's all thank B.K.S. Iyengar for coming up with the supported version! If you don't have all the equipment shown, don't give up. We all have a bed or a coffee table that can easily be used instead of the chairs. 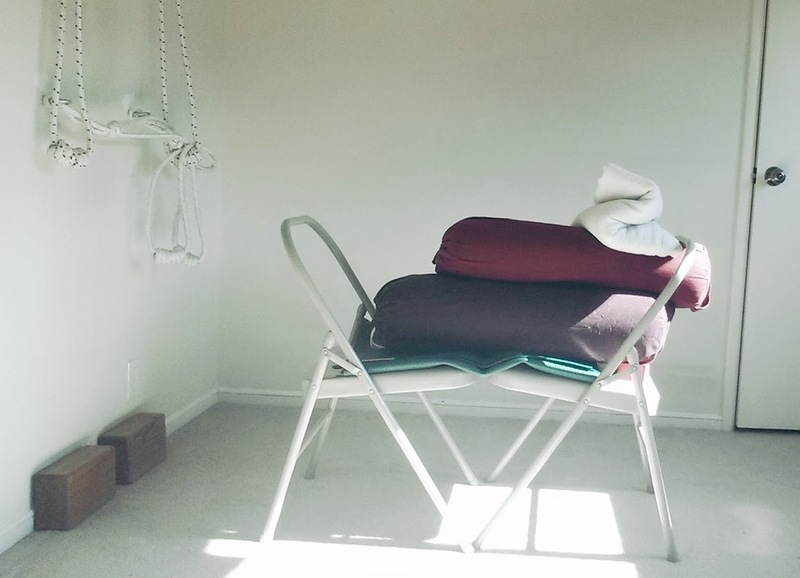 If you don't have a bolster or bolsters, then simply roll or stack thick blankets. As in yesterdays supported Savasana for the heart, the upper chest region should feel both supported and spacious. If you have a heart problem or other issue affecting your health in the chest area, use support for the arms so the chest can be wide and deep (vs. just going for a "good" stretch). Savasana is considered both a resting pose and a meditation posture. At the end of an asana class we frequently lie down flat on the floor and use Savasana to reflect on our practice. In pranayama (breath control) practice we generally use support to open the chest. Almost two years ago my cousin who was in her 30s had congestive heart failure. It was a shock to us all because she didn't have any of the risk factors. To her credit, she made some major changes to her life which included yoga, exercise and nutrition and is now almost fully recovered. Shortly after the heart failure when she was recovering, on the advice of my dear teacher Victoria Austin, I gave her the following version of Savasana to do twice a day. B.K.S. Iyengar designed what we call either a Simhasana box or a "Heart box" which gives the strongest effect in both opening the upper chest and deeply resting the physical heart at the same time. A fantastic student of mine, Dan Pelsinger, who is a carpenter offered to make the box for us - thank you Dan! You can create the same shape as the box using two bricks and a bolster or blankets as shown. Both shoulder blades should feel like they are fully supported and the heart should feel like it's almost floating in open space. If you position things right, there should be a deep sense of relaxation but at the same time an experience of lucidity. Like the sun shining in a clear blue sky. The pose can also be done in a chair, anywhere! Photo courtesy of Adeline Yoga Studio in Berkeley. Virasana (Heroes pose) is a seated pose. The word root "vir" means "a brave man". A VIRtuous man is one who is willing to kneel down with patience but with his "sword" at the ready should the need arise to protect and serve. Prasarita Padattonasana (Wide leg intense stretch) is a standing forward extension pose that helps us to become comfortable being upside down. Please make sure your head is supported on the floor or a block before attempting the arm movements. We start in with the concave back position with the hands on the floor. Just for fun (my idea of fun and your's might be different....) I am showing some different hand placements that help you to open the wrists and shoulders. And might prepare you for some other fun poses? Like Adho Mukha Vrksasana (Full Arm Balance) arm variations! Parvottanasana (Intense side flank stretch) is indeed intense and thorough in opening your body and mind! To build the actions needed in the legs, play with a chair! Then use a chair with the backrest on the hip crease to "levelize" your hips and seat the thighs back as we practiced yesterday in Ardha Uttanasana at the wall. Using the chair you can walk your hands down towards the floor extending the sides of the chest fully. Now try the full pose with Paschima Namaskar arms. Use the hands at the back to work on extending the front body. Parsvottanasana (Intense Stretch of the Flank) is a very thorough and fundamental standing pose. To build faith and confidence in your legs to hold you up while your hands are tied behind your back. do Ardha Uttanasana with the hands to the wall. Practice firmly pressing the weight of your legs and hips aways from the wall, while extending the chest towards the wall. The hands become a built in prop in Paschima Namaskar. Push your hands into your back to keep your upper back in and chest lifted.